As you’re obviously (painfully, perhaps annoyingly) aware, product advertisements of the old-fashioned, antiquated, and well, dated kind are right up my alley. I’m strange in that very special kind of way, but I love watching commercials and looking at print advertisements that have a certain shock factor to them. They’re shocking because they tote a certain idea (outdated thinking or morals) that can cause uncomfortable laughter from a modern audience. When I look at these types of advertisements, I try to remove my modern thinker’s hat first, and attempt to understand the way of thinking and living when the advertisement appeared. Then, I put on my modern thinker’s hat and realize, “holy ****, this really was a thing. Someone believed this, thought this, or someone actually lived by this standard for this to even exist.” Cause and effect dictates such – you do something/say something/wear something, and advertising promotes it as a norm. The reason that today’s topic even came to light for me was when I was doing some quick research on Lysol for my recent Flashback Friday article about Lysol Country Scent Spray. What started off as a quick reading about Lysol advertisements toting their effectiveness against 1918 Spanish Flu turned from practical application to all-out bizarre use. I give you this 1935 Canadian print ad (the origin of the advertisement has no bearing, it was just mentioned in research where it came from) for Lysol. So um, yeah. This use. 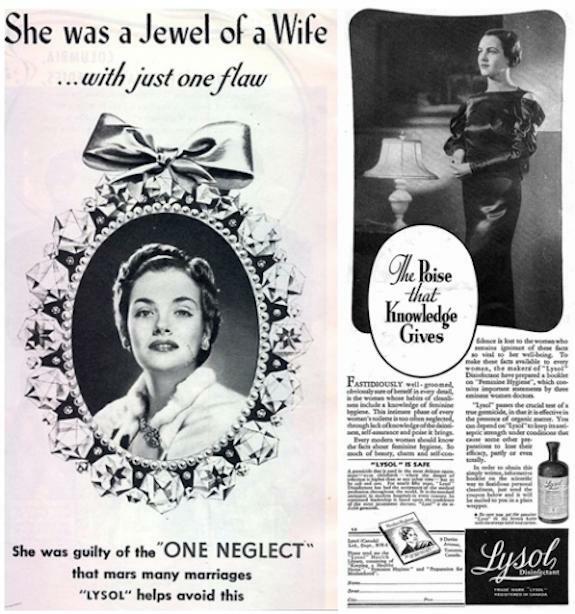 In the late 1920s, Lysol’s manufacturer, Lysol Inc., promoted the use of Lysol (diluted of course) as an effective feminine hygiene product, meant to keep vaginal odor at bay, and prevent infection down there. By doing this, they toted, youth and marital bliss would be preserved. Because looks or personality be damned – if your lady business isn’t disinfected by the same product that cleaned up after a flu pandemic, then marital bliss is out the window! It was a widely-held belief by the medical community that post-coital douching with Lysol was an effective means of birth control as well. The use of Lysol in feminine hygiene actually resulted in the elimination of good bacteria, resulting in bad bacteria to thrive, and to also cause inflammation, burning, and the masking of possible issues that an odor would cause. In extreme cases, death was even a possibility. Really makes you want to use Lysol for everything, am I right? And horrible means of feminine hygiene wasn’t even the worst thing Lysol ever caused. Death by Lysol Poisoning was a dark reality, and it happened in Australia in 1911 as the most common means of suicide. Not feminine hygiene use, but ACTUAL FREAKIN’ INGESTION. I wish I was kidding, but I’m not. Not even a little bit. And it didn’t prevent pregnancy. Not even a little bit. By the early 1960s (simultaneous “thank goodness!” and “what took so long? !”), the days of Lysol as feminine hygiene/birth control product were over. Birth control became available by the mid-1960s, Summer’s Eve became a safer and more effective form of feminine hygiene, and I used a Lysol wipe to clean my kitchen counters tonight. I cringe thinking about the very idea of what Lysol promised to under-educated females drawn in by images and catchy copy. Scare tactics and worries of contemporary culture outweighed the idea of any harm, which was (obviously) not advertised.